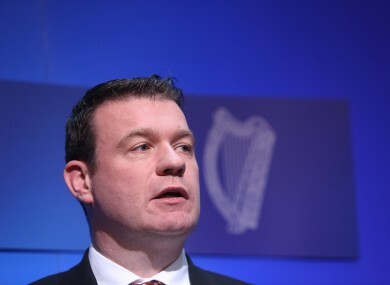 FORMER ENVIRONMENT MINISTER Alan Kelly has maintained he was right about the government’s ability to abolish Irish Water. The European Commission yesterday issued a response to Sinn Féin MEP Lynn Boylan that some took as confirmation that Ireland could not abolish the utility. That response from the executive body of the EU would appear to tie the government’s hands regarding the scrapping of the controversial charges and Irish Water itself. At the implementation of the EU’s Water Framework Directive in 2000, which was designed to improve the quality of water across Europe, Ireland was the sole member country which did not introduce water charges. The contentious Irish Water charging scheme was introduced by the Fine Gael-Labour coalition. However, in a post-election deal between Enda Kenny’s party and Fianna Fáil, it was agreed that the issue of water charges would be referred to a commission, then an Oireachtas committee. Eventually, all TDs will vote on how the water supply should be paid for. As most members of the Dáil are now against charges, it’s likely the payments will be scrapped. Speaking on RTÉ’s Morning Ireland today, Kelly insisted that a stance he had taken in March that Fianna Fáil’s pledge to scrap Irish Water was against EU law had been vindicated. “You can tweak it as regards the type of charges, but the derogation that we have with regards to water charges is long gone. We have to have water charges,” the Labour TD said. It’s either going to end up as fines (for the country) or we have water charges. Kelly said that the Fianna Fáil-Green Party government had told the European Commission in 2010 that Ireland would introduce water charges, making the system the “established practice”. “We have to ensure that the ‘polluter pays’ principle is enforced. We have EU laws that we’ve signed up to. In such cases, EU law takes supremacy over national law because we signed up to it. You can’t just cherry-pick which EU laws you adhere to. Kelly went on to say that the fines imposed on Ireland could “start off in the millions”. Both Boylan, the Sinn Féin MEP who sent the query to the EC, and Fianna Fáil’s Barry Cowen have rejected the European Commission response. “The established practice in Ireland is to pay for water through taxation, not Irish Water,” Boylan said yesterday. Cowen said his party would “refute and contradict” the European response. Meanwhile, Kelly’s former government colleague Simon Harris, also speaking on Morning Ireland, said the expert commission set up to examine water charges would be looking at Ireland’s international and European obligations. The country was not scrapping water charges, the Fine Gael health minister insisted. Asked whether the EC response meant Ireland still had the flexibility to abolish charges, Harris said his view “in addition to being in support of water charges is and remains that there is an obligation on Ireland in relation to water charges from a European level”. With reporting from Daragh Brophy. Read: Is Ireland set to go to war with the European Commission over water charges? Email “Alan Kelly says he's been proven right about Irish Water”. Feedback on “Alan Kelly says he's been proven right about Irish Water”.